Today, many of the most recognizable decorative styles are those that go back in time. What was once a trend, is now back, stronger than ever, if that is possible, accumulating great historical and artistic value and taking over the most exclusive interior designs. However, what is recovered must be reinvented and adapted to current lifestyles. For this, trends are renewed and updated, adopting the same aesthetic characteristics but with extra innovation, quality and modernity. The industrial or urban style seems to have come back from the past to stay. It has its origin from the young New York artists who, in the 50s, settled in old warehouses and factories, eager for wide spaces brimming with light. It is a style that is both casual and rough and ready, with character as well; with bare walls; recycled objects; and without stridency. If there is something that really highlights industrial decoration, then it is the materials that are used. When recreating this style, it is not possible to succumb to the preservation of functional elements typical of the structure itself, such as brick walls, exposed beams and pipes, concrete, wood and metal floors and ceilings. With this style, materials appear to be as they are: pure, untreated, and with the very essence of that which makes them noble. 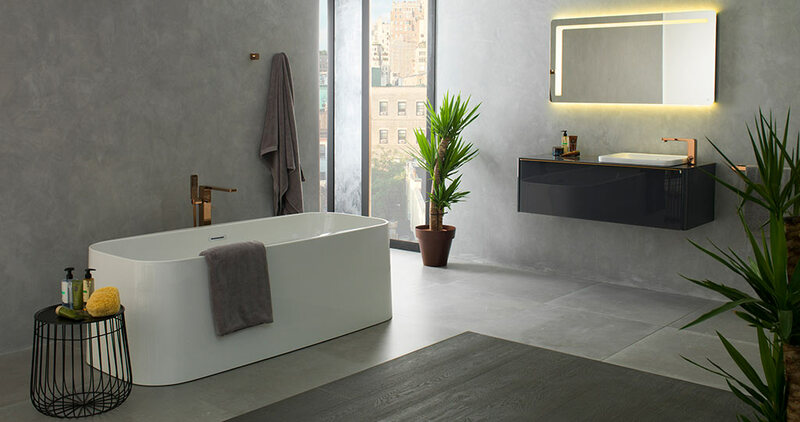 PORCELANOSA Grupo through its wide product range for floorings and coatings, suggests recreating that industrial style urban touch in an updated way. 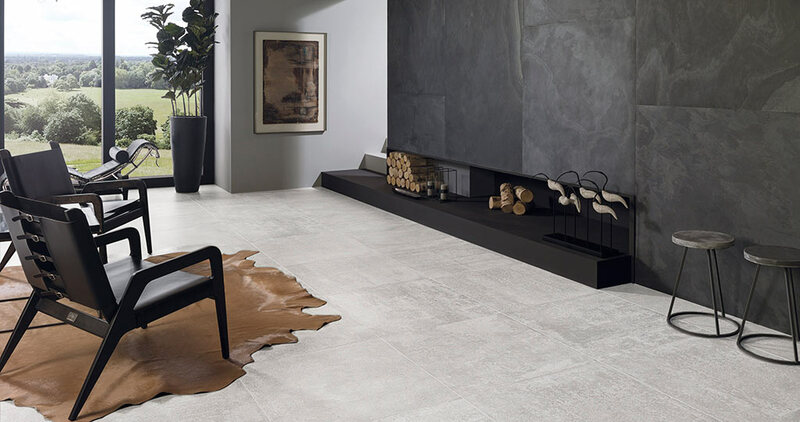 For that purpose, it is inspired by the exquisiteness of the noble materials in the form of porcelain tiles, so that the aesthetic result is highly elegant and maintains its high quality. Industrial style bases its origin on the concept of lofts. It has its influences in industry, where everything fragile and delicate gives way to the utilitarian and robust. The walls are bare, as if they had never been treated or decorated. Therefore, one of the most significant materials is cement or concrete. 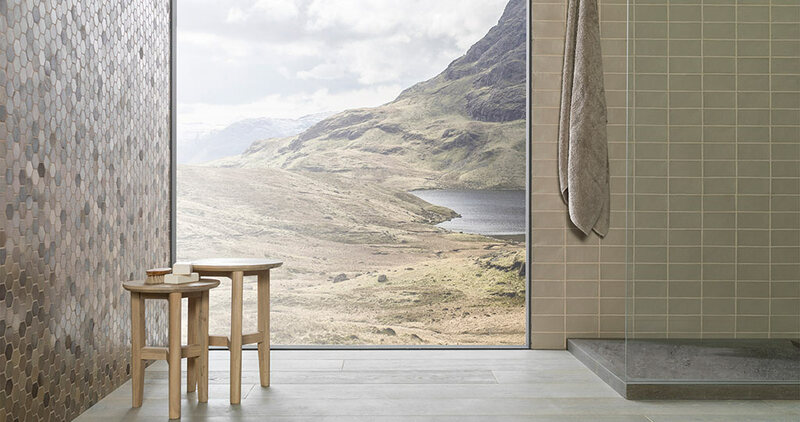 Current trends in interior design provide, in this sense, exquisite concrete effect finishes, perfect for a delicate, simple and minimalist industrial style. 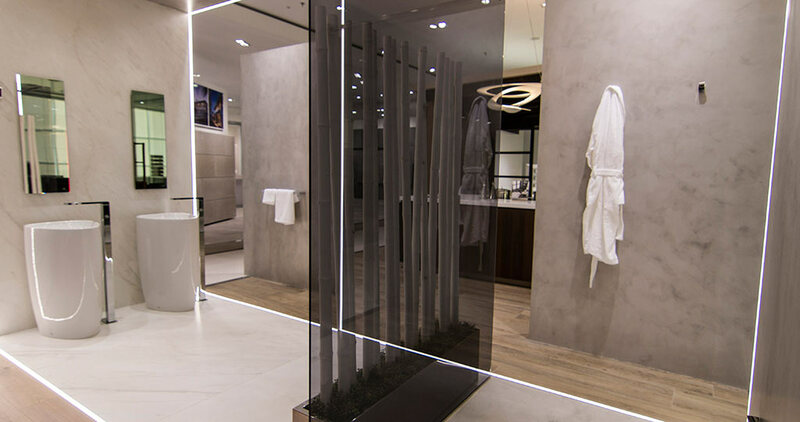 The PORCELANOSA Grupo offers, within this concrete effect, various designs and finishes, such as the Frame Clear and Dark porcelain tiles from Venis; or the Dakota Bone from the Porcelanosa collection. 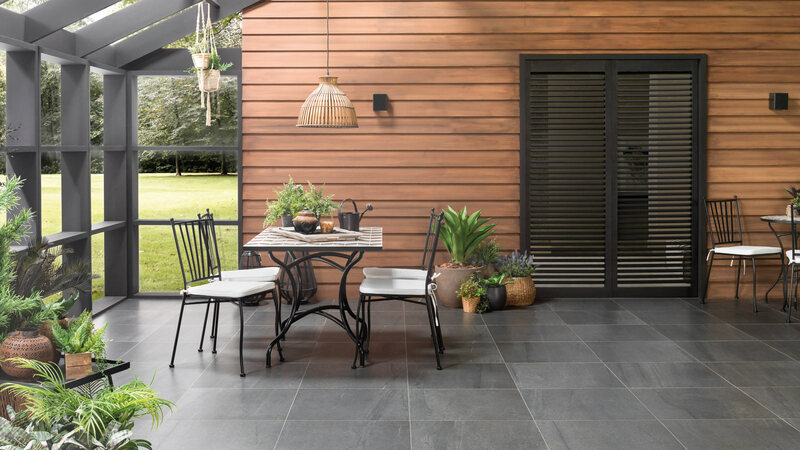 The latter stands out for its sophisticated industrial designs in porcelain tiles for floorings, but also for coatings, with a unique imperfect and seemingly unshiny finish. Whilst looking for that coating effect in a cementitious finish, we also find Micro-Stuk Design from Butech. 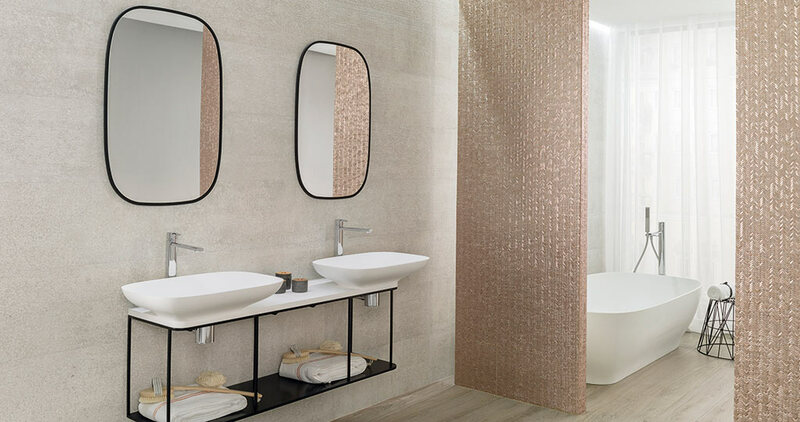 This decorative continuous wall tile offers an imperfect and unique finish, while guaranteeing high performance and maximum quality. Bricks are another of the materials that best represent industrial style, above all, face bricks used for walls, without coating or decorating. Showing the very soul of the structure, along with finishes that are old, imperfect, flakey. 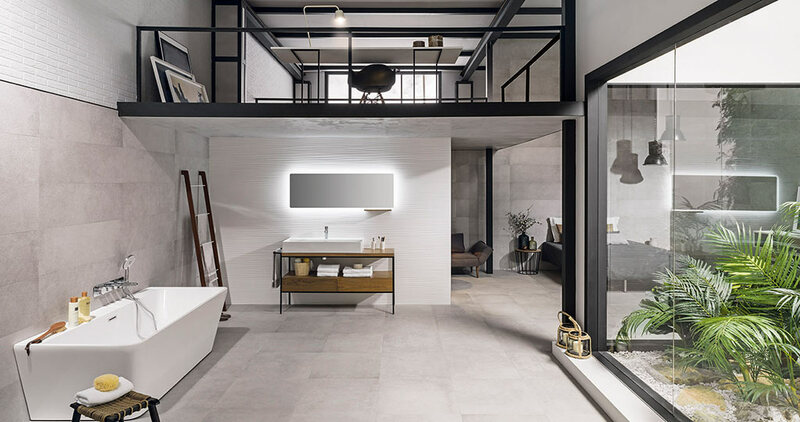 The PORCELANOSA Grupo, however, suggests reinventing this trend, and does so through the suggestion of ceramic tiles that closely resemble the brick effect, with exclusive and current finishes. 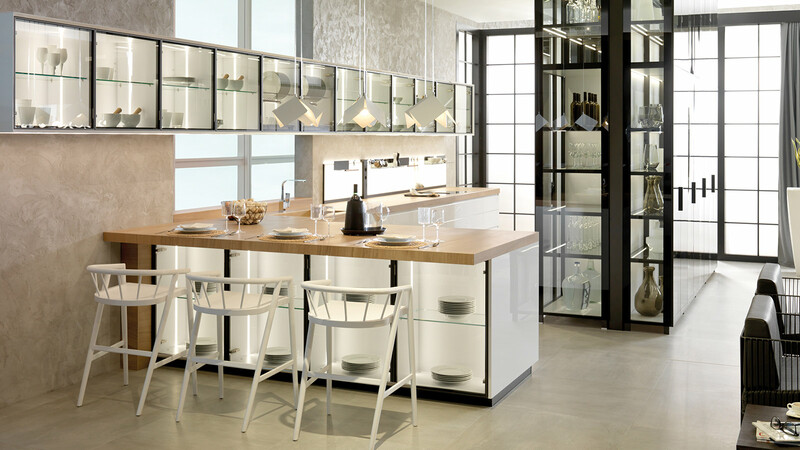 In addition, it offers a wide range of industrial style tones: white, black and grey, along with brown, beige and blue. 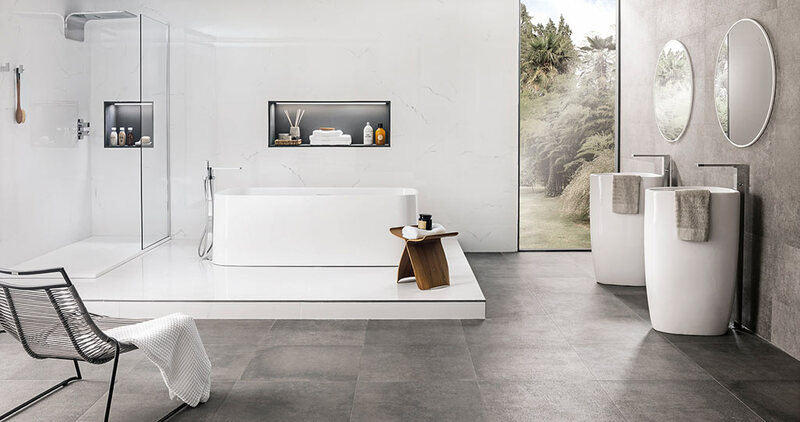 Among the series suggested by the PORCELANOSA Grupo for this purpose are the Signature and Ibiza collections from L’Antic Colonial and the Amsterdam Grey Sand mosaic, with dark tonality and small retro inspired tiles. 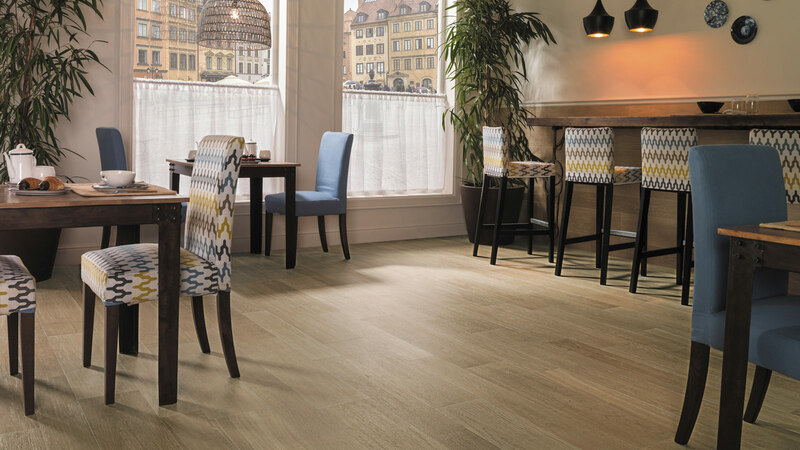 Wood is introduced into industrial styles with a recycled and aged look. 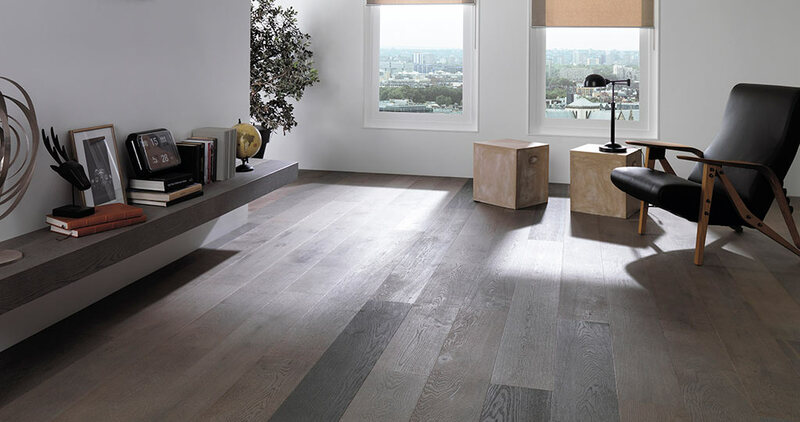 It is more common to see it in the form of decorative elements, although it is also usually a part of the structure through exposed beams or parquet flooring. 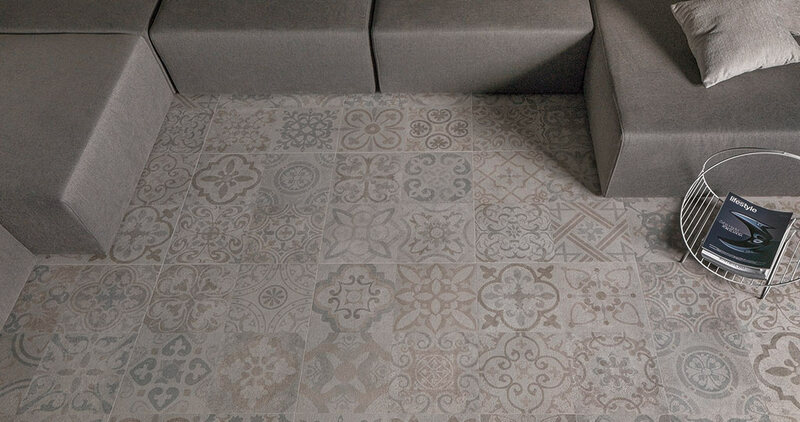 The PORCELANOSA Grupo, among its parquet collections, puts the new Eden 1L Laguna from L’Antic Colonial forward. A model that stands out because of its deep veins and imperfections which increase the industrial effect, which noble materials provide. Another way of introducing wood into contemporary industrial spaces is through wooden mosaics which suggest origin and maximum authenticity. Wooden Wall mosaics from L’Antic Colonial can be the perfect material to cover a corner with character, providing it with its own personality. Industrial style is featured by reflecting that retro essence from the interior designs of the past. 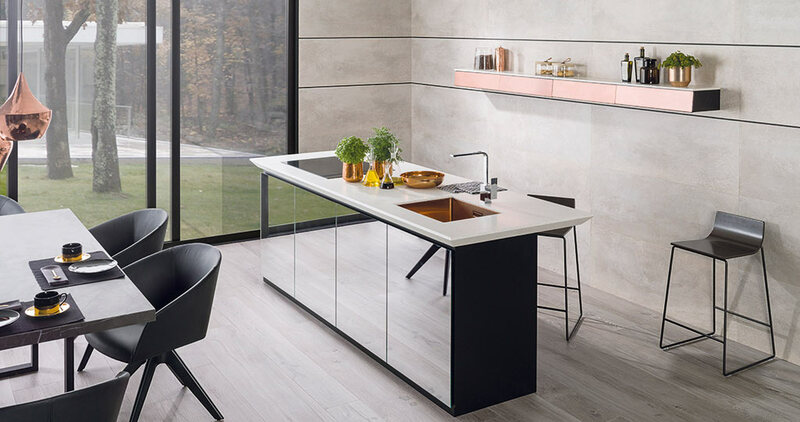 For this reason, it is not surprising that this decorative style allows for the introduction, in the form of floor tiles and wall tiles, and hydraulic inspired tiles such as the Deco Frame collection by Venis. These kinds of materials increase the beauty and uniqueness of spaces, while taking us back to those old style houses with that vintage charm. In addition, they have a decorated concrete effect finish, which complements the Frame series, perfectly. It is a highly present material, also in industrial spaces. 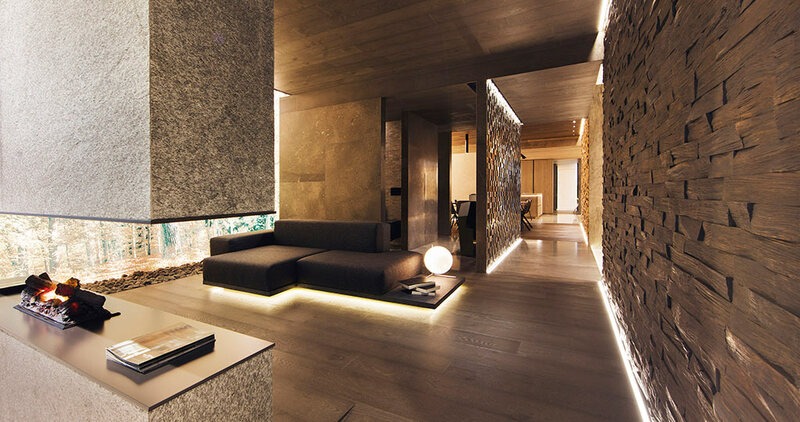 It reminds us of the purity of building structures, combining essentially wood, concrete and metal. 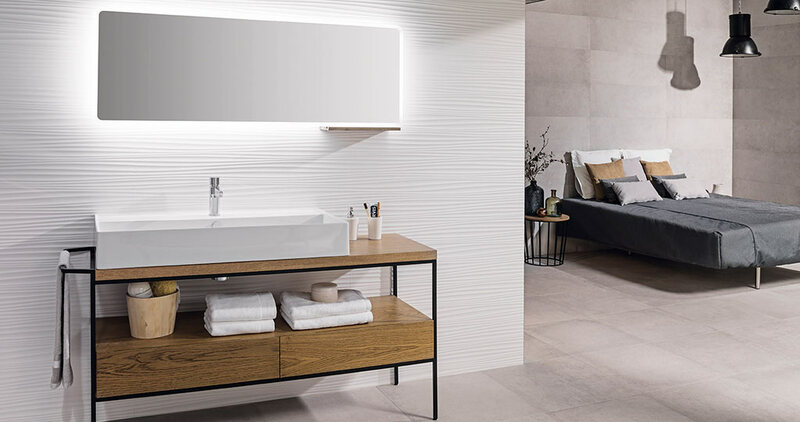 To introduce it in a subtle and sophisticated way, the PORCELANOSA Grupo recommends its decorative profiling Pro-Part Laton Graphite range, the decorative element capable of making industrial wall tiles become a lot more exclusive.